This is my Personal DNA. I need to be more girly, me thinks. Jen is off to the US and then the UK in the next few weeks. Mei and I decided to take her out for food, drink and an opportunity to sing Girls Just Wanna Have Fun on George Street. During dinner, I dropped three eggs that were thrown at me, Jen was hit in the eye with a warm omelette and Mei managed to catch her fried rice even while not being able to put her feet on the egg covered floor. I highly DO NOT recommend I Chi Ban. Thank goodness the company was awesome! After a dinner that was saved by required consumption of riesling, we went on the Zeta Bar at the Hilton. A reasonable amount of cocktails were consumed. Mei scored us a great little sitting area after only one drink at the bar. After that we settled in for the night. Phone calls were received (sorry Rock for the hostage situation) and statistical questions were answered (throw the dice as much as you want but throwing one six does not mean the second six is more probable). The resulting graze from the fall I took in the middle of Wentworth on the way home. You should see the other guy! 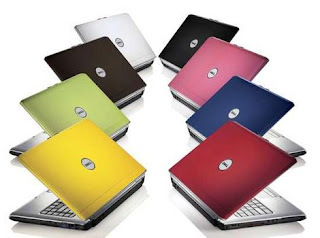 It was pointed out to me today the the reason I think the new Dell notebooks are ugly is because I am no longer the target audience and I am officially old. I'm not totally convinced. They really look ugly. It's like bringing back the coloured iBooks a decade later. 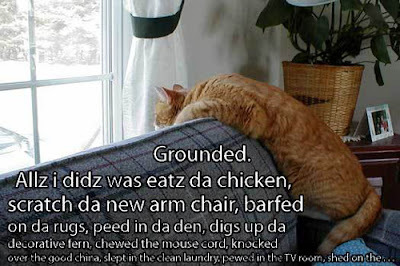 For anyone who has ever owned a cat and wondered if you are the only one this happens to. Here is a real review for "the worst movie tie-in toy ever". It is very funny but probably not aimed at children, or parents or people who don't like strong language. As a professional who builds software for people who I will probably never meet, I need a good kick once in a while to remind me that obvious to me is not obvious to all. It has nothing to do with intelligence or experience but more to do with seeing the world as a programmer. For a day and a half, I have been using word to write a requirements document. Wait, let me finish before you close the page! I set up a style for a numbered list and chose an option that said "Automatically Update". I assumed it meant that when I updated the style in the style manager window, all paragraphs with that style would be updated. Ummm, no. Usually this wouldn't have bitten me except that every time I created a new numbered list and changed it so that the sequential numbering started again, every single list item with that style applied would also be changed. It resulted in a document with a list of 1-20 items instead of 4 lists of 1-5 items. It took me a while to realise that once you change a calculated attribute of the paragraph, the whole style would update and so would all the calculated values. I now understand why this is happening but I don't agree that it should. Are programmers annoyingly helpful when they should just leave obvious alone? The 6th annual SakeFest was held on Friday the 22nd of June, 2007. It was my first time to join the drinkers of 3 x 1.8L bottles of sake and consumers of not too bad Japanese food. It was held at Sapporo restaurant in Crows Nest. For our second bottle we ordered sake with a "Quiet grain-like aroma"
Twitter allows me to share my current activities and thoughts in microbursts. Blogger makes it easy for me to share my new life in a new town with my family and friends. Even the reading I do online is automatically gathered for me. It's the life. A place to go to keep in touch with friends. It is different to blogging or reading blogs. It is more about communication. This is where all that has happened, is happening and will ever happen in my life is recorded. This is where my videos go and where I go to watch music, shows, people and stuff. Much better than iGoogle. This is where I go to see the Interblag at one glance. This is where everyone is during the work day. It's how we talk and arrange coffee. That is it for 2007. Where do you spend your time online? I'm home with the worst cold ever today so I accepted Michelle's invitation and joined Facebook. It is fun so far but I need to make more friends. Annabel is off to Paris. Dave is moving to Sydney to work. They had a party to farewell Canberra. For me it was more of a celebration of the great escape. There were fireworks, half 44 gallon drums burning house building off-cuts, toxic green cocktails and comatose cheerleaders. I recently had a run in with VS.NET 2005 when I attempted to install it on a work machine. It did get to the state that I could work in it but the Help functionality would not... help at all. After putting an extra 1GB of RAM in to the box and replacing the funky switch it was plugged in to, which sometimes would only allowing 0.5MB/minute (yes, minute) down, Help is now working! The thing is that I wanted to use locally installed MSDN and not online Help but hitting F1 or choosing anything in the Help menu would crash the IDE. When I say crash - it would stall and do nothing forever (I left it one night and it was still dead when I returned the next day). Why is VS.NET 2005 insisting on going out to the 'blag if I've already specified my preference for a local MSDN? Update on the whole car registration situation. We gathered up the dozens of millions of documents and all real bonafide absolute actual owners of the car and went to the RTA today. After waiting for 30 minutes for our ticket to be called (310 came after 011, 012, 01x where x is infinity, 307, 308, 110, etc...) the very helpful by-the-book woman behind the nice safe counter told us that she could not process two license changes and a registration because that added up to two transactions and ticket 310 wouldn't allow it. After looking in a pleading way at ticket 310, it stayed silent and lucky-she-was-behind-a-screen lady convinced me to get a new number and wait the turn to get my number called for a license transferral. I won't go through the way they count again. Long story short - we try again tomorrow with the "exact address" on a bank statement or energy bill and a form signed by a GP telling them I am fit to drive a car (long story and not related to suspected mental illness that I know you are thinking about). PS I am not Gollum. Us is Giles and I. Big boats sail by my window at work quite often. They always look like they are not going to fit under the bridge but they always do. Here is a P&O or some other boat on the way out of our lovely harbour. The weather Sydney and eastern Australia is receiving at the moment is terrible. It is wet and cold (Sydney got down to 14 degrees) and there is zero protection. Even walking through the city under the shelter of buildings, it was ridiculously wet and miserable. On the windy walk home, there were dozens of dead umbrellas. The small streets were small wind tunnels that blew you out in to the street as you ran past them. The bigger streets... well, they were big wind tunnels. The news is reporting washed out roads, traffic accidents and 250 calls per hour to the SES. Apparently it is only going to get worse over the next 24 hours. The best plan is to stay inside, order pizza and watch TV. My current manager is a very logical and pragmatic kinda guy. As we discussed the need to start building our new framework and I commented that we should stop talking and just start working it out, he paraphrased Lewis Carroll and said..
"I start at the beginning, go on to the end, and then stop"
Mad Hatter: Something seems to be troubling you. Won't you tell us all about it? March Hare: Start at the beginning! Mad Hatter: Yes, yes...and when you come to the end, STOP! A guy built a catcam and discovered the secret life of cats. Check out one of the four sets of photos his kitty took at the bottom of the page. As your wedding planner, I recommend you watch the third Pirates of the Carribean movie and base your ceremony on the one that happens in the movie. Watch this movie anyway. It's awesome!